Since his introduction to Dance music in 2001, David Stephens, better known as Anderson, has become one of the scene’s most respected industry professionals. Armed with his unique arsenal of Deep House wonders, which includes hits like: ‘Foreign Feathers’, ‘Downfall’, ‘Resilient’, ‘Shift Control’, ‘Nocturne’, ‘Domain’ and ‘Tralia’, the multitalented artist has been signed up by labels including Elektrified Music, Urban Latin Records and Mayer’s Records, gaining monumental support from A-List stars from around the globe. Next up from Anderson is the perfectly crafted EP ‘Third Round EP’. Containing ‘Underscore’, ‘Drum Cycle’ and ‘Boiler Plate’, this Techno infused House, three track EP is full of groovy and driving basslines, mind-blowing percussion work, intricate vocal work, lush chords and dark underground vibes, making it the perfect addition to any DJ’s record collection and is sure to get ravers grooving in clubs on a global scale. 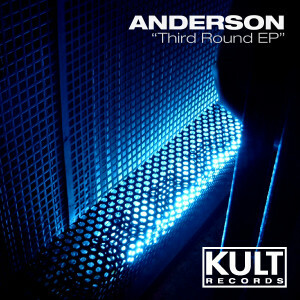 The release of ‘Third Round EP’ sees Anderson make his highly awaited debut on renowned imprint Kult Records. The New York based label, are responsible for kickstarting the careers of international stars including Seamus Haji, Robbie Rivera, Danny Buddah Morales, Deep Swing and Lenny Fontana – demonstrating that they are one of America’s most prestige labels. ‘Third Round EP’ is out now and is set to see Anderson’s long running success continue at rapid pace. We speak to Nina Kraviz ahead of her set at Jaded’s 7th Bday this Weekend + Comp winners announced! Jammy’s Jaunts: 23.11 – 24.11 – The Boiler Room Part 2, Rejam, Antidote and CLR.